Director of Eugene nonprofit outlines process for creating shelters, micro-homes for homeless. Around Oregon, communities are starting to put together shelters and tiny home communities to address the problem of homelessness and lack of affordable housing. Last week, Dan Bryant, of Eugene, who has been instrumental in those efforts, spoke to a group of about 50 people on how Madras could use similar models. In addition to his position as senior minister at the First Christian Church in Eugene, Bryant is the executive director of Square One Villages, a nonprofit "dedicated to creating self-managed communities of cost-effective tiny homes for people in need of housing." Besides the people in need of mental health services, he said, "Eleven million Americans face eviction every year simply because they don't have money to pay the rent. Rents are raising faster than income." Problems causing homelessness might also include domestic violence, or a lack of services or treatment options. Initially, the city of Eugene had a car camping ordinance, which allowed people to stay in recreational vehicles. That has been expanded to allow up to six in an area, such as next to a church, he said. Other options include Conestoga huts — micro-shelters with about 60 square feet of insulated interior space and 20 square feet of covered porch space, with a lockable door. They cost about $2,000 each to build, and are not heated, but are warmer than a tent. In 2013, Opportunity Village opened its first micro-housing units on an acre of city-owned land. "It's a gated community for the homeless," he said, noting that people are vetted and approved before they can move in. There are currently 17 of the shelters, housing 20 people, but over the past five years, Opportunity Village has sheltered about 160 people. The village has a shower house with two showers and toilets, and a heated yurt, which he described as "the community living room." Residents must follow rules, and everyone is required to put in time helping manage and maintain the village, which cost about $200,000 to construct — from donations and in-kind materials and labor. Villagers pay $35 per month toward the operating costs, which amount to about $4,800 per month. In 2016, the nonprofit changed its name from Opportunity Village Eugene to SquareOne Villages, he said, reflecting the need for villagers to "start at square one." The nonprofit purchased property for a tiny home village in 2015, and started work in 2017 on Emerald Village Eugene, with 13 different architects and build teams donating their time to build the units for about $25,000 each. The homes range from 160-320 square feet, and are self-contained, with sleeping and living areas, a kitchenette and a bathroom. "Villagers have to put in 50 hours of sweat equity," he said, adding that to qualify for the homes, villagers had to be homeless, or in a transitional program, and able to pay $250-$350 per month for the home. Before the village was built, Bryant said that the let neighbors know that it is not a service for homeless people, but rather housing. When neighbors were surveyed, 90 percent approved. "It's a proven concept," he said. "It works very well." "The reality is, you have homeless people in your community," said Bryant. "They're here already. This is a benefit to the whole community." 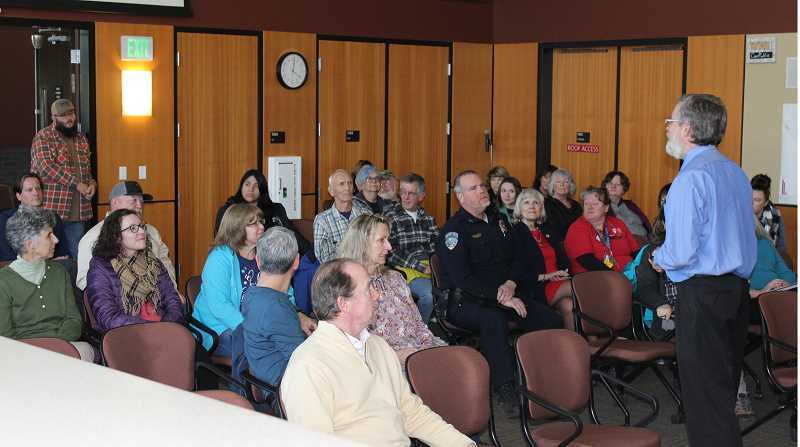 Madras Community Development Department Director Nick Snead saw Bryant's presentation in Redmond, and had the city's backing in bringing Bryant to Madras for the presentation. "The next step is to see if our citizens have an interest in moving forward with this," said Snead.